Yahoo and other billion-dollar companies taught us that understanding employee strengths, without consideration for their placement along the growth cycle, is like missing your front teeth. Nearly all large companies leverage some type of cognitive diversity tool. Among the most popular administered are the Myers-Briggs Type Indicator and DISC. During my 20+ years of big corporate life, I’ve also experienced: Management by Strengths, the Predictive Index, and others. While each contains valuable insights into behavior preferences, they’re missing the tie of individual strengths to corporate strategy. Imagine having a box of multi-colored crayons. Each crayon has a defined strength—its unique color. Now consider the assignment to color the ocean. Blue is needed more than yellow. When the assignment changes to coloring a firetruck, red becomes more important based on the current mission. Ever try eating an apple without your front teeth? It is possible but could be done more efficiently with a complete set of pearly whites. My colleagues and I call the combination of individual strengths and corporate strategy “Strategic DiversityTM”, and the AEM-cube® is a modern tool, based on cybernetics, that quantifies them together. What personality indicators are missing is the link between individual employee strengths to current corporate strategy. We learned the concept in 2012-2016 as we developed the Innovation Lab (i-Lab). Through trial-and-error, we learned the effectiveness of cognitive tools and employee engagement were amplified exponentially when tying those activities to a specific director-initiated strategy. We went from a focus of talent development to one of actualizing potential into profitable performance. For example, in early stages of i-Lab development, the program encouraged “blue sky” ideas. Although tangible solutions were generated, they were missing executive buy-in. Once we shifted the program to a specific director-selected need (i.e. we need to color the firetruck this quarter), results were implemented quickly—improving corporate agility. So, we were able to create a synergy between the use of cognitive ideas and corporate strategy. Over time, we added cognitive diversity tools, like Myers-Briggs, and combined personal strengths within the context of specific corporate strategy. It accelerated new market development because we knew immediately where each set of strengths could contribute most powerfully to the assignment at hand. Employees understood which crayon was needed, based on the specific mission. Last year, when introduced to the AEM-cube, a lightbulb moment occurred for me. 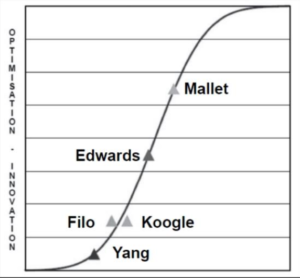 Based on cybernetics, the model ties personalities to their specific contributions on the successive phases of a Growth-curve. It is the first tool I’ve experienced that compensates for the ecological and financial attributes of “Strategic DiversityTM”. An example used in David Thomson’s book – Blueprint to a Billion – is the case of Yahoo (Fig. 1 below). Thomson recognized that within many of the successful billion-dollar companies’ founding teams, a diversity of cognitive thinking existed. At Yahoo, Yang represented the initiator (like Steve Jobs at Apple) and Mallet provided the COO-type balance of efficiency (like Tim Cook at Apple). Yahoo’s cognitive diversity allowed it to be agile in a highly competitive environment. Tying employee strengths to corporate strategy (a.k.a. Strategic DiversityTM) allows companies to quickly identify where potential may be actualized more effectively into profitable performance.